I am utterly ashamed of the fiasco that had happened at Quirino Grandstand in Rizal Park, Manila yesterday. A dismissed police officer, Senior Inspector Rolando Mendoza, took all 25 people, most of them are Hong Kong tourists, on board a tourist bus as his hostage. His demand? To be reinstated to his previous post in the Manila Police District. He was axed because of misconduct. And what he did is the stupidest thing to do to get his job back! After failed negotiations, Mendoza was already distressed. When he saw his brother and son being hauled by the police officers on TV in the bus, that's when he cracked up and executed some of his hostages. Lots of gun shots followed inside the bus. 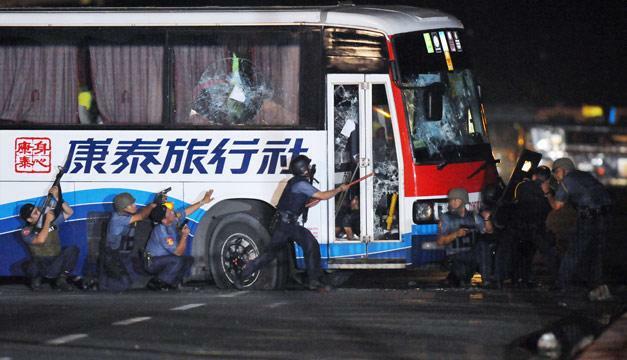 It led the policemen and the MPD no choice but to assault the bus, even exchanged fire with Mendoza. It ended with Mendoza dead with gunshot on his forehead by a sniper. Some tourists died too, some of them got lucky to be alive including the driver of the bus who managed to escape. Who was to blame to this mishap? Is it the negotiators who wasn't able to handle the situation properly? The media who was there to cover the details of basically everything that was going on for the world to see? The policemen? Or Mendoza who had gone crazy and started all this in the first place? I feel sorry for the victims on board especially to those whose lives were taken because of a cop-gone-mad! Still makes me feel disappointed and angry when I think about what happened yesterday. A wrong decision which ended up in tragedy and shame for our country! We live in a crazy world, very crazy. These things have become an epidemic, perhaps we should watch less television? Yes, we live in a crazy world. Err, I still would want to see what's going on with these crazy world on tv. :D Thanks for commenting though! tc! Indeed girl haist he put us so so down.... Lagpak na nga ekonomiya natin, dinagdagan pa niya..
A disappointment. Hope this won't cause any harm in between two nations involved. i've seen the live footage of the hostage taking and the hostage only started shooting people in the bus when he saw his brother treated inappropriately. Also, I am wondering why he was dismissed before even facing the trial to clear his name. There must be some stinks that those who truly did the misconduct are hiding. thanks for commenting, though! tc!